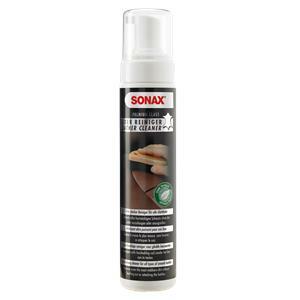 SONAX Premium Class Leather Cleaner effectively cleans all types of smooth leather. Especially fast acting, with intensive effect and maximum material compatibility. Removes even the most stubborn dirt such as grease and staining of jeans without leaching out or attacking the leather. With foam dispersion for especially easy application and effective dosing. Suitable for all smooth leather, also for perforated leather surfaces and seats with seat heating/cooling. Do not use on aniline, nubuck, velours or suede leathers.